Hear the latest updates regarding FirstNet’s progress toward implementing the nationwide, interoperable, public safety broadband network. Texas public safety officials will be on hand to describe their perspective on planning for the FirstNet network, as well as efforts in launching a public safety broadband network under an agreement with FirstNet. Chris Essid of the DHS Office of Emergency Communications will provide an overview of the revised NECP which addresses a number of highly relevant aspects of recent and anticipated developments in emergency communications, including: PSAP continuity of operations, integration of NG9-1-1 networks into the broader emergency communications ecosystem, continued focus on P25 compliance and standards development, support for the ongoing efforts of FirstNet, and the growing importance of cybersecurity as new Internet protocol-enabled technology is integrated into public safety operations. This session will address considerations for planning for NG9-1-1, including integration of NG9-1-1 systems and centers with FirstNet and other emerging technologies and services as well as securing public safety communications networks from cyber threats. Push-To-Talk over Cellular adoption has grown significantly. This is leading to more opportunities to improve Public Safety interoperability, expand user base, and drive cost efficiencies for many non-mission critical users. This session will provide (1) An overview of Push-To-Talk over Cellular & (2) An overview of integrating Land Mobile Radio with cellular. Attendees can expect a better understanding of available non-mission critical communication technologies that can enhance public safety’s communication experience. Quick, informative 20-minute presentations on topics addressing a variety of innovative technologies in public safety communications. These talks are designed to spur thoughtful dialogue in a fun and engaging setting. Vehicle-to-vehicle and vehicle-to-infrastructure communication technology represents the next giant leap in automotive safety, providing the ability for cars to ‘talk’ to each other and the infrastructure around them to avoid motor vehicle crashes. And we’re not just talking about cars talking to other cars but about cars talking to bikes, trucks talking to motorcycles, buses talking to pedestrians, and even traffic signals communicating with vehicles to help prevent crashes and reduce traffic tie-ups. What will be the impact on public safety and emergency response and how can both leverage these advancing technologies? This briefing will explore the use of various technologies integrated together forming an Event Planning and Management System (EPMS) to assist your planning and operations team more efficiently support events. The briefing will cover the use of standards based planning via FEMA’s NIM ICS structure, the use of mobile identities and temporary badges to support accelerated check in/out functions, geospatial location of assets in near real time, and business intelligence to financially track planning and execution. The presentation will describe progress in LTE EPC virtualization, standalone networks for field deployment, and other technologies tailored for public safety, and present two recent applications case studies demonstrating system integration in support of public safety communications. James Wolfinbarger, ILPS Industry Specialist, Motorola Solutions, Inc. The influx of data can be both incredibly beneficial and overwhelming for public safety departments. It takes smart data analytics to reduce the complexity and prioritize information that police, fire and EMS need to do their jobs in a more efficient and safe manner. How should departments approach these technologies to improve their operations and what are some of the best practices associated with the implementation of these applications? In this session, experts from Motorola Solutions will share their insights on how the Ventura Police Department has integrated data analytics into existing systems, the roll-out/implementation plan and new capabilities public safety can realize from data applications focused on real-time information sharing. In February 2014, APCO and the National Institute of Standards and Technology (NIST) hosted a Public Safety Mobile Application Security Requirements Workshop. 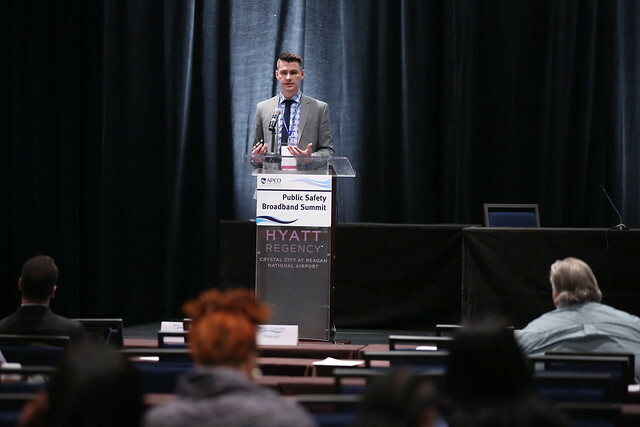 This first-of-its-kind event brought together public safety practitioners, app developers, industry experts, and government officials to identify initial security requirements for apps intended for public safety use. In this session, NIST staff will describe the workshop and the team’s production of a white paper capturing initial public safety security requirements for mobile apps. Open to all attendees, free shuttle service will be provided to AT&T’s nearby headquarters for a reception featuring appetizers and beverages, and opportunities to meet and greet with AT&T executives. Also technologists from AT&T’s Foundry in Plano will be offering demos of the latest innovations in communications. FCC Public Safety Bureau Chief Admiral David Simpson will provide a status of key developments in public safety communications. APCO and the FCC have been focused on improving wireless 9-1-1 location accuracy, including indoors. This session will help explain what attendees need to know about recent developments. Various technology companies and wireless carriers will be on hand to discuss the challenges and potential solutions for wireless 9-1-1 location accuracy. The greatest mission for 9-1-1 response is to reliably and efficiently pinpoint callers’ locations. Citizens calling from indoor multi-story, densely-populated areas are often unaware that their location cannot be identified. Standards must evolve; as the FCC establishes location requirements for wireless calls placed indoors, we can learn about capabilities of advanced location systems. Small cell technology and smart data analysis may provide means to help responders find people indoors. Learn about technologies designed to better determine callers’ INDOOR locations and how existing and emerging systems can make the display of this location information more usable and more understandable. APCO’s Jeff Cohen will have an interview-style conversation with Verizon’s Don Brittingham on the role of wireless carriers in improving 9-1-1 location accuracy. Tim Lorello, Senior Vice President, TeleCommunication Systems, Inc.
Getting the precise location of a 9-1-1 caller has always been a challenge for public safety. With more calls coming from indoor environments, the challenge has only increased. The FCC recently indicated an intent to provide mandates for indoor location accuracy and is asking for initial progress in as little as two years. Is the industry up for this challenge? This session will explore both current GPS technology and emerging technologies – such as Small cells, Bluetooth, WiFi and metropolitan beacons – which promise to improve indoor location accuracy. Recommendations will be presented for how these solutions can be combined to deliver unprecedented granularity, accuracy and location trustworthiness. This session will discuss new standards based technologies designed to better locate emergency callers, be them outdoors or indoors. How these technologies can be leveraged for both improved location accuracy and dispatchable locations will be discussed. In today’s technology-driven world, faster, smarter, and more agile consumer products have the ability to change the way we live and work. Some products in particular have developed a broad applicability that span multiple sectors, to include the law enforcement community. This session will highlight adaptable technologies such as cloud storage and video. In particular, this session will outline specific challenges associated with storing video taken by law enforcement officers, and will offer insight into just how much video storage a law enforcement officer may need. The session will also offer cloud-based solutions for improving agency workflow. Priority services, the ability to pre-empt users, and Quality of Service (QoS) are all crucial to a public safety broadband network. FirstNet’s Brian Kassa will discuss how FirstNet is working through the Public Safety Advisory Committee (PSAC) to develop a Priority and Quality of Service framework that will allow for a system design and policy that meets the day-to-day needs of public safety, but is capable of growing with incident severity. *Note: During breaks attendees will visit tabletop displays.